I was inspired to acquire a bunch of books related to space (which I’ve always had a love for) after my husband and I coincidentally watched both The Right Stuff and Apollo 13 in the space of a single week in January. I also bought the books those movies were based on (The Right Stuff and Lost Moon) and Canadian astronaut Chris Hadfield’s biography, but this was the book I dived into immediately after it arrived. 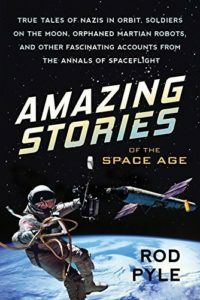 Amazing Stories of the Space Age is exactly what it sounds like (well, once you know it’s non-fiction anyway). It describes various space-related plans, projects, and missions devised by space agencies around the world, most of which were never built. Some of them are pretty wacky, some are ideas you really wish had been explored further, and some are just ridiculous given current scientific knowledge. They are all immensely creative and fascinating to read about, though. And there are also some stories about things that have actually happened, such as the history of the Buran, the Soviet Union’s competitor to the U.S. space shuttle. It is clear that the author has done extensive and meticulous research (including very recently declassified documents) and each chapter is bursting with detail while also being very accessible to a general audience. There are a lot of great illustrations, often from the source material itself and there are also a few pages of pictures and photographs included. The author is obviously enthusiastic about the subject and it’s infectious, it’s easy to get swept up in the narrative (which is not something I usually say about non-fiction). I think this would be a good book both for people unfamiliar with the history of space exploration (since it offers a breadth of topics that are all engaging and not too long) and space enthusiasts (because it is full of obscure and interesting trivia). I’m looking forward to checking out some of the author’s other books.